Faith McShane was found on Thursday, January 15, 2015, in Zumbrota, Minnesota. 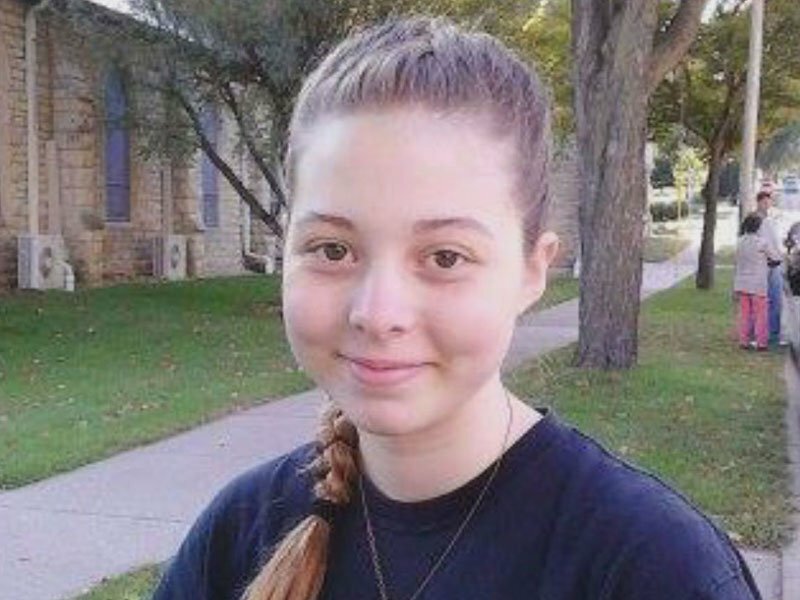 Faith was last seen after being dropped off at Roosevelt High School on Monday, January 5, 2015, around 8 a.m. She was reported as a runaway that afternoon by her mother. Early into the investigation, officers and detectives learned that Faith may be staying with a distant relative in Red Wing, Minnesota. The Red Wing Police Department was informed that Faith may be in their jurisdiction. The Red Wing Police Department was instrumental in locating Faith, and she was found in a home in Zumbrota, Minnesota, by the Zumbrota Police Department. It was learned that Faith McShane planned well ahead to run away. She took numerous steps to actively evade law enforcement during the time she was missing. The information will be sent to the State’s Attorney’s Office for review and there is a possibility others involved may face criminal charges. Faith’s parents were notified she was found. They will pick her up from Minnesota and return her home. 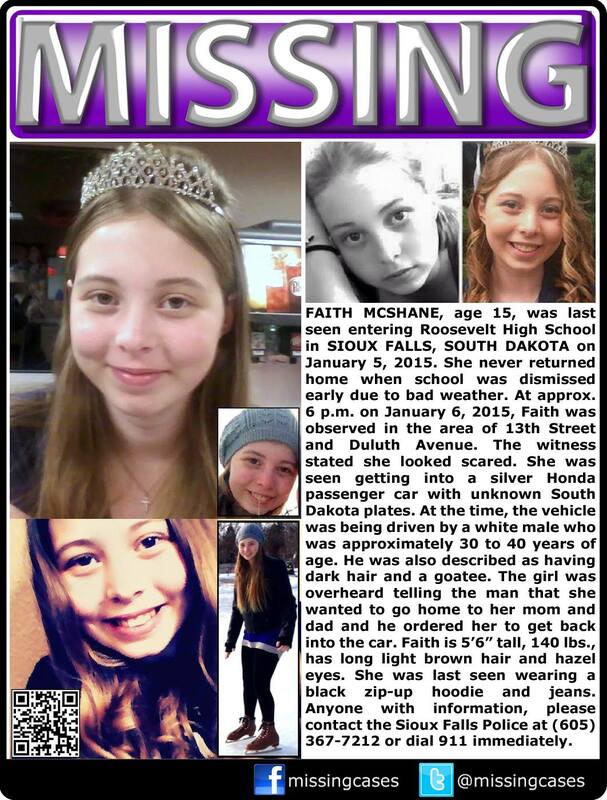 Faith McShane, age 15, was last seen entering Roosevelt High School in #SIOUXFALLS,#SOUTHDAKOTA on the morning of Monday, January 5, 2015. She never returned home when school was dismissed early due to the recent snowfall. At approximately 6 p.m. on Tuesday, January 6, 2015, Faith was observed in the area of 13th Street and Duluth Avenue. The witness stated she looked scared. She was seen getting into a silver Honda passenger car with unknown South Dakota plates. At the time, the vehicle was being driven by a white male who was approximately 30 to 40 years of age. He was also described as having dark hair and a goatee. The girl was overheard telling the man that she wanted to go home to her mom and dad and he ordered her to get back into the car. Faith is 5’6″ tall, 140 pounds, has long light brown hair and hazel eyes. She was last seen wearing a black zip-up hoodie and jeans. Anyone with information on her whereabouts, please contact the Sioux Falls Police Department at (605) 367-7212 or dial 911.